Poster has a dotted background black and white photo of men in football uniforms crashing into one another. 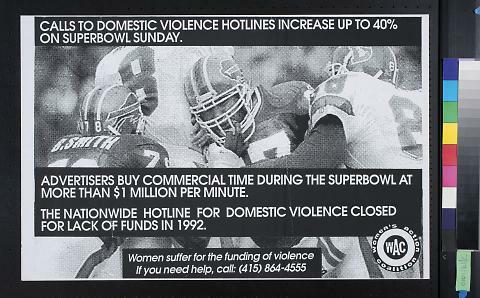 In a black screenprinted bar across the top is white text reading "Calls To Domestic Violence Hotlines Increases Up To 40% / On Superbowl Sunday." In a similar bar near the bottom of the poster has white text reading "Advertisers Buy Commercial Time During The Superbowl At / More Than $1 Million Per Minute. / The Nationwide Hotline For Domestic Violence Closed / For Lack Of Funds In 1992." Centered at the bottom of the poster is a number to call if you need help related to domestic violence. At the bottom right corner is a Women''s Action Coalition (WAC) logo.